Recently we’ve received a question from one of our customers asking how to synchronize data between companies servers and a data warehouse server. Let’s see how easy it can be done with the help of dbForge Data Compare for SQL Server, a professional tool for SQL data comparison and synchronization. The SQL table for company1 is Company1$Customer. The SQL table for company2 is Company2$Customer. We need to create a data warehouse with all information stored in one set of SQL tables. For example, the created data warehouse should contain a Customer table that contains all records of Company1$Customer and Company2$Customer. This table should contain an extra field with a company name to make the records unique. We need to synchronize only changed records. We have created a view on the servers of Company1 and Company2 that will be used for data synchronization with a data warehouse database. 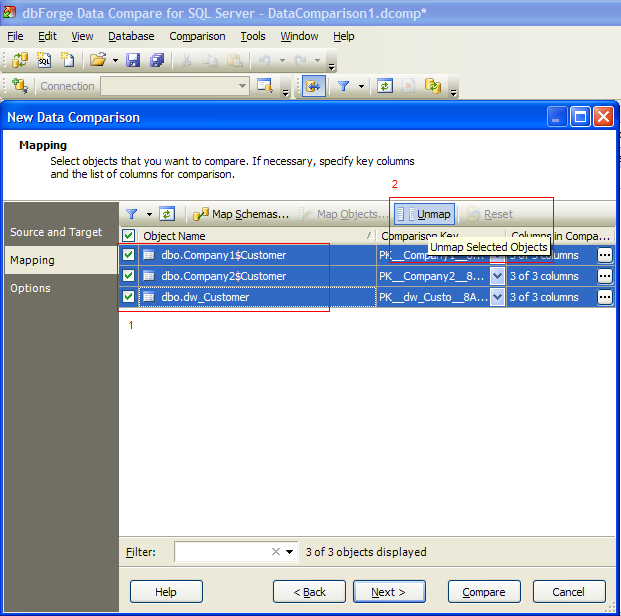 For example, create a non-indexed view in a database of the Company1 and an indexed view in a database of the Company2. 1. 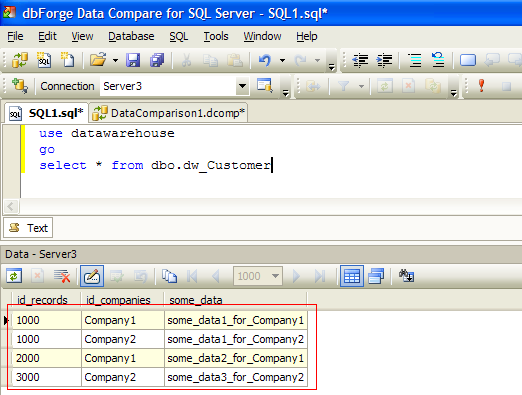 Run dbForge Data Compare for SQL Server and select Company1 database as Source and datawarehouse database as Target. In addition, select Views check box to compare views, as well as tables. 2. Go to Mapping wizard page and press Map Objects button on the toolbar. In the opened dialog map vCustomer view with dw_Customer table. 3. 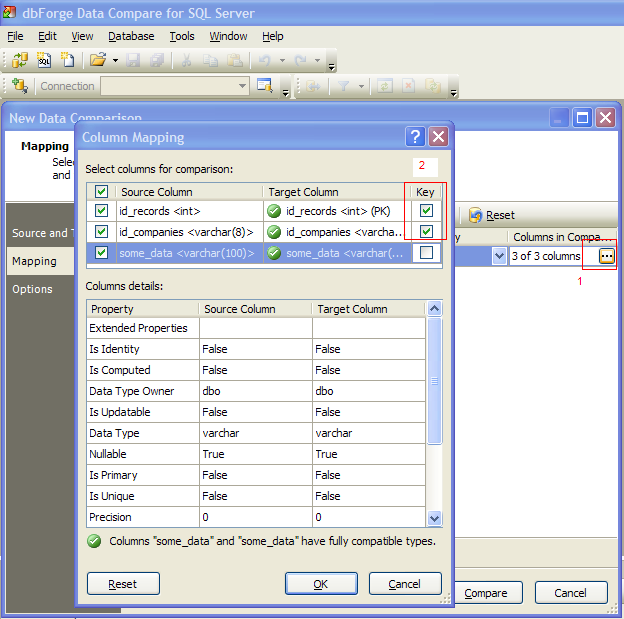 In the Column Mapping window select id_records and id_companies column as a comparison key. 4. On Options wizard page unselect Only in Target check box (as we will only update and insert the data, but will not remove the existing data) and press Compare. 5. When comparison is completed, open the synchronization wizard to synchronize the databases. 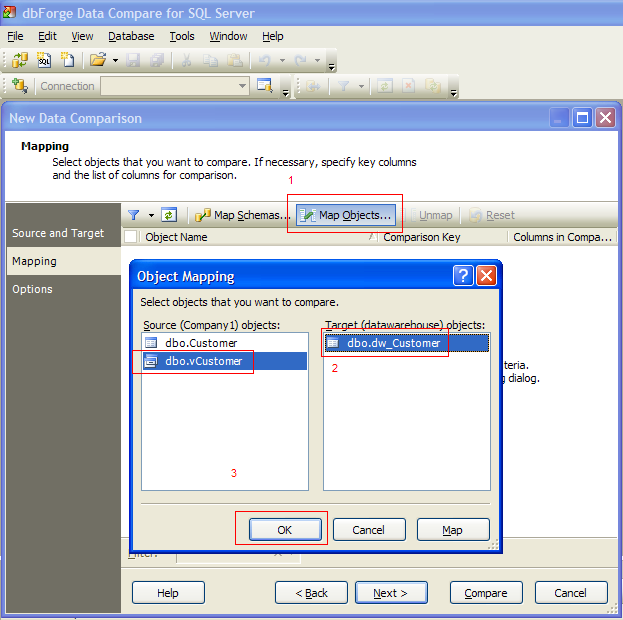 Repeat steps 1-5 for Company2 database (skip step 3 as in this case we use the indexed view and dbForge Data Compare for SQL Server will automatically set the right comparison key). Press Synchronize. If due to some reasons, its impossible to create a view in Company1 and Company2 databases, you may do the following. In datawarehouse database, create temporary tables for each company (for data synchronization with each company), then merge data of these temporary tables with a table of datawarehouse database. 1. 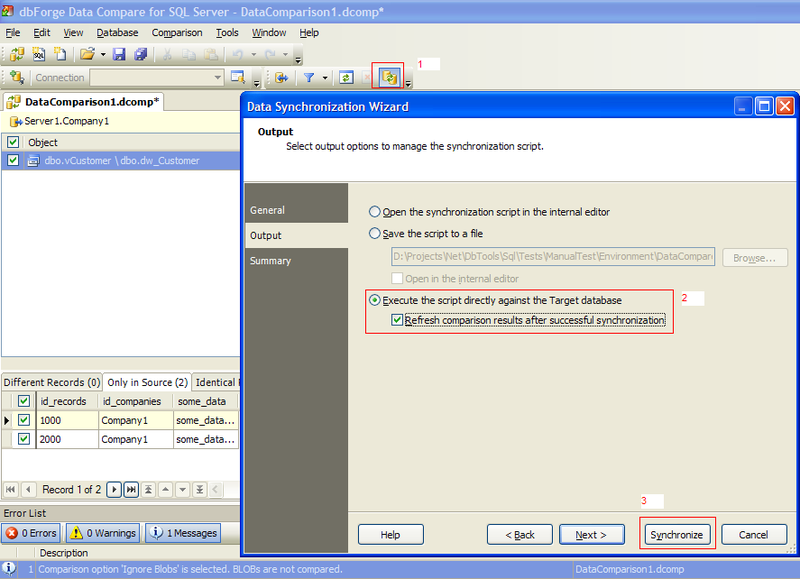 Run dbForge Data Compare for SQL Server and select Company1 database as Source and datawarehouse database as Target. 2. Go to Mapping wizard page and press Map Objects button on the toolbar. In the opened dialog map Customer table to Company1$Customer table. 3. In the Column Mapping window select id_records column as a comparison key and press Compare. 4. When comparison is completed, open the synchronization wizard. Press Synchronize to synchronize the databases. Repeat steps 1-4 for Company2 database to synchronize Customer table with Company2$Customer one. 5. Then select datawarehouse database as Source and Target. 6. 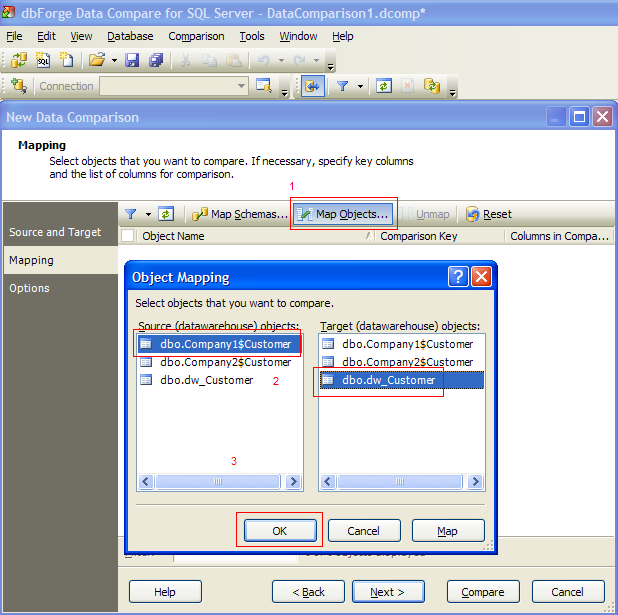 Upmap all the tables in the Map Objects window and map the following tables manually: Company1$Customer (as Source) and dw_Customer (as Target). 7. On Options wizard page unselect Only in Target check box (as we will only update and insert the data, but will not remove the existing data) and press Compare. 8. When comparison is completed, open the synchronization wizard to synchronize the databases. Repeat steps 5-8 to synchronize data of Company2$Customer table with dw_Customer one. 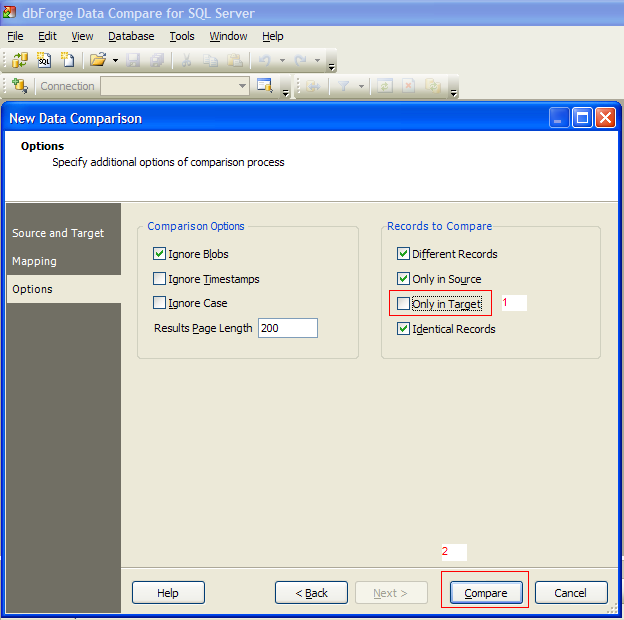 We have described several ways to use dbForge Data Compare for SQL Server to complete such tasks. Of course, if we had possibility to compare Custom Query, then in the first case we would not have to create views and would be able to compare the result of the query with the table. In the future versions of the product we plan to implement the functionality for comparing Custom Query with tables, views, or other Custom Query. Also the process of server synchronization with the help of a comparison and synchronization tool can be automated and started in certain time. To do this, an application should support command line. In the second version of our product, we have added the ability to perform all operations using command line, without GUI.